Hey Java---you owe us a pic. Crap! Sorry. Try this one. A special dental warning film: What happens to those who don't brush their teeth! 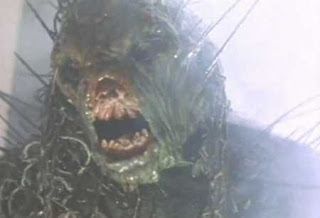 The Love Child of Swamp Thing and a Porcupine. Actually...nope. But, yeah, it would be effective to use in a classroom scare film about not brushing your teeth. Is it Class of Nukem High? Hell, yeah! You are up! DAMMIT! I KNEW that one too! just ONE post too late!! Have fun! This is from one of my favorite bad movies! By the way, I have never seen Class of Nuke'Em High. The only reason I recognized the picture is because I have read the review on this website! Is this the poor man's version of The Prisoner? Is it Dark Star ? Here is a hint: This movie was released in 1997. I can see this is causing some trouble! Should I give another hint or just reveal it?